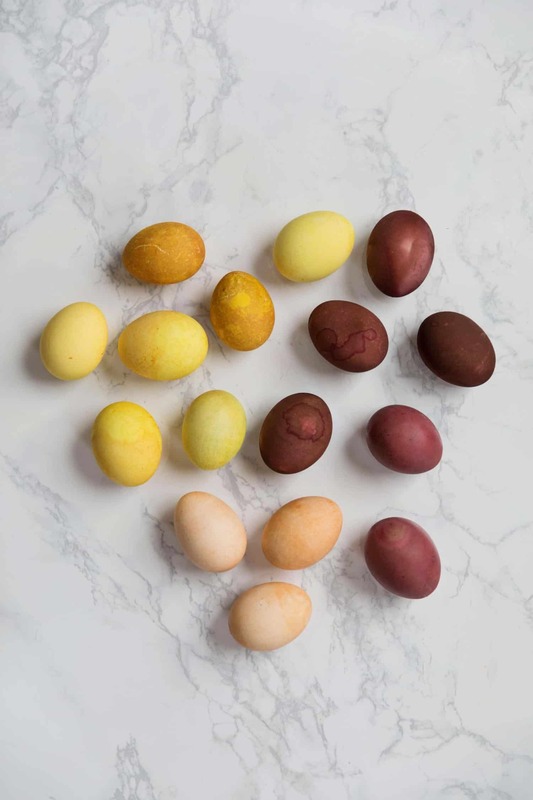 I’ve wanted to dye our Easter eggs with food-based dyes for years, but it all felt a bit overwhelming and uncertain. The more health-conscious our family becomes, though, the more motivated I am to switch out old habits for safer options. Options that are just as stunning in the end! I am so happy with the warm tones I was able to get using items from our grocery store and know we’ll be trying even more colors next year! 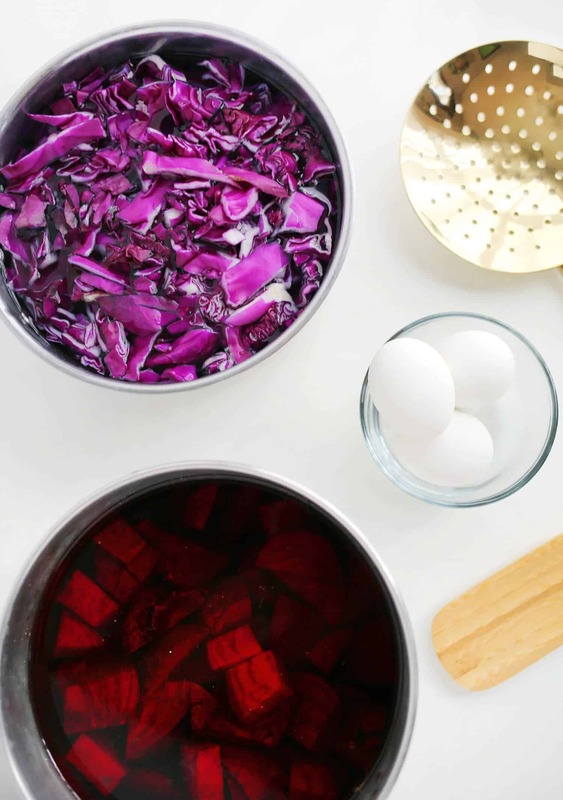 If you’re wanting to try natural dyes this Easter because you want to skip the fake, processed dye tabs or maybe you are just as curious as I am about the magic of drawing color from plants, this is the tutorial for you! If you’re hoping it’ll be a tidy, quick process … well … we can all learn to slow it down a bit, right? Ha! 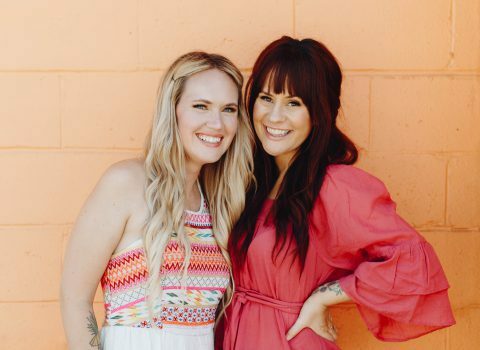 It IS something your kids can help with and you can rest assured that your hard-boiled eggs can be snacked on or turned into egg salad leftovers because all items involved are natural and plant based! 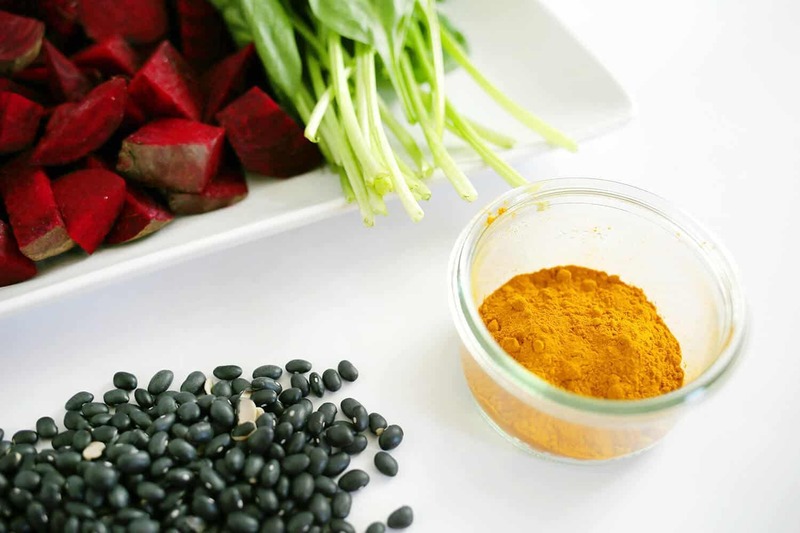 There are conflicting methods out there for how to get the best colors from your plant-based dyes, as well as how long to let them sit in your dye pot, to heat or not to heat, etc. I’m here to share what worked and what left me slightly uninspired. The good news is, the colors that did turn out made my heart skip a beat after seeing them all together! Below I’ve organized instructions and ingredients by color in case you’re only wanting to use some of them. note: white vinegar washes out green from spinach so don’t add vinegar to this one. I was most disappointed with my beet dye experiments. I saw a few examples of bright pinks, fuchsias, and even pastel pinks, but I just couldn’t get my pinks to take on my white eggs. The colors that did take ended up pickling the eggs because I added too much vinegar and they dented when I tried picking them up. Saddest face emoji!!! I do love the cranberry, maroon shades but they don’t exactly scream springtime to me. I’ve heard a substitute for a good pink or red is cranberries, but I couldn’t find any in our grocery stores. You may have better luck than I did! If you’re wanting to get your feet wet with only two dye pots, I suggest doing red cabbage and turmeric. You can get your blues and yellows and then mix the blues and yellows to get different shades of green. If you can find a happy red/pink, then you’re set! Once you’ve decided on which colors you want to use, chop up your vegetables into small pieces and add them to a sauce pan that is filled just over 3/4 of the way full. To extract the richest colors, you’ll want to heat these to a simmer (tiny bubbles on the edges and steam coming off the pot) for about 20 minutes. 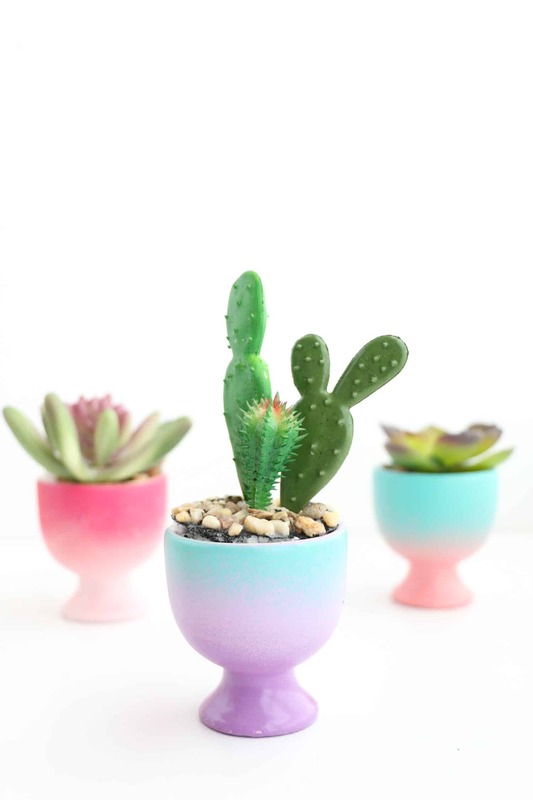 Let them cool and then strain your dye through a strainer into a glass bowl or some container that will allow your eggs to be submerged. The amount of liquid from one sauce pan should be enough to dye six eggs each. 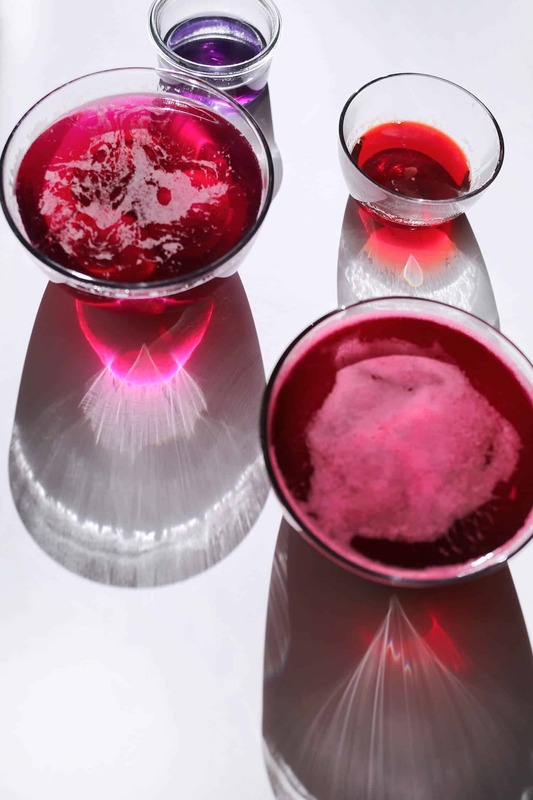 You can also separate your dye into two bowls and add vinegar to one of those bowls. This will allow you to get two colors from the same dye pot. 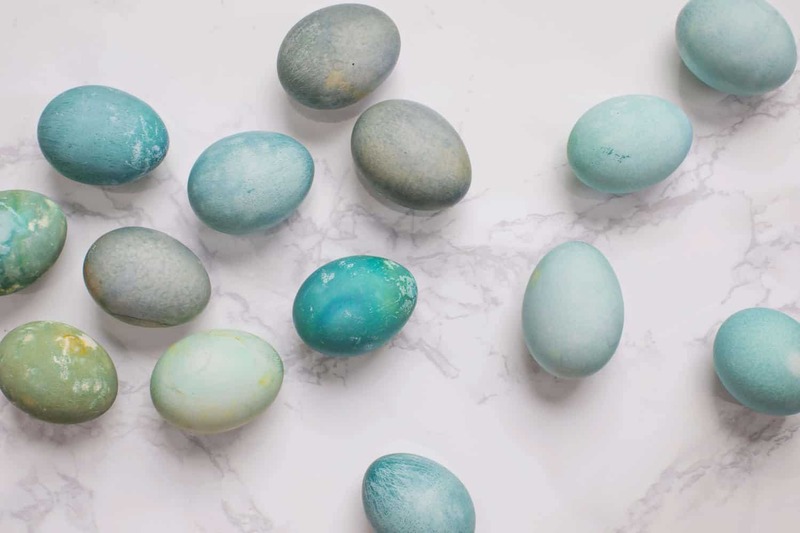 Let your hard-boiled eggs rest in your dye at least two hours. You can also try letting them dry and dipping them again for two more hours. The richest colors will come from leaving them to soak overnight. 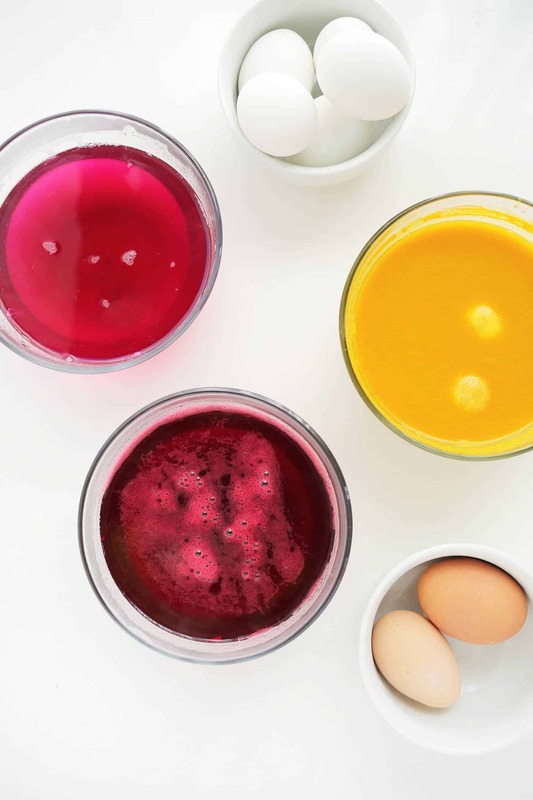 If you’re dyeing with children, older kids can help with cutting vegetables and straining liquid. Younger kids can help by dyeing the eggs and checking on them after the timer is set. It’s a great way to teach them about science while letting them explore the connection between plants and colors. 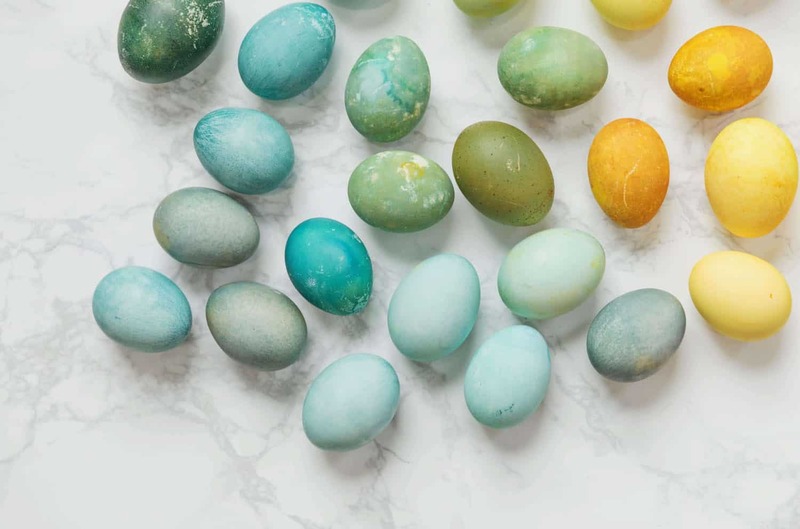 You can also draw on your hard-boiled eggs with wax crayons before adding them to the dye baths to create fun patterns or cover them in stickers. Add glitter if you dare! Other colors that I’ve seen used are coffee grounds, blueberries, saffron, yellow onions, and green tea. I love this! 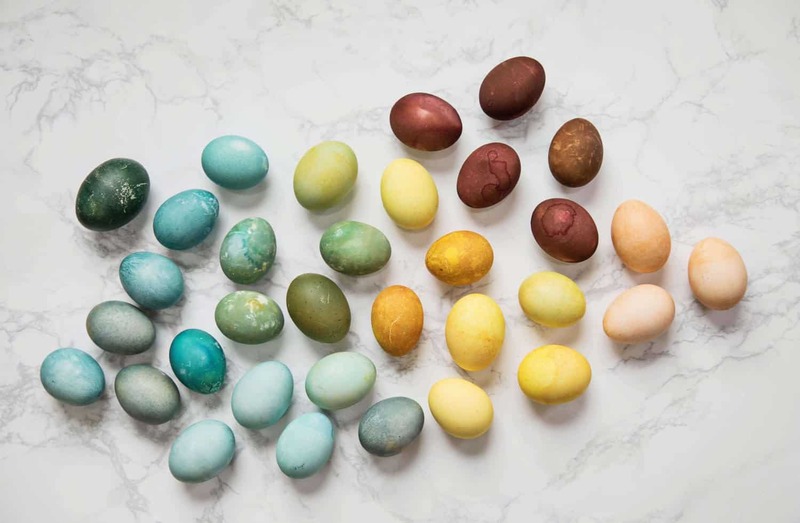 I’ve never tried dyeing eggs using natural ingredients (aka with anything that’s not food dye), but I’m thinking of doing this. 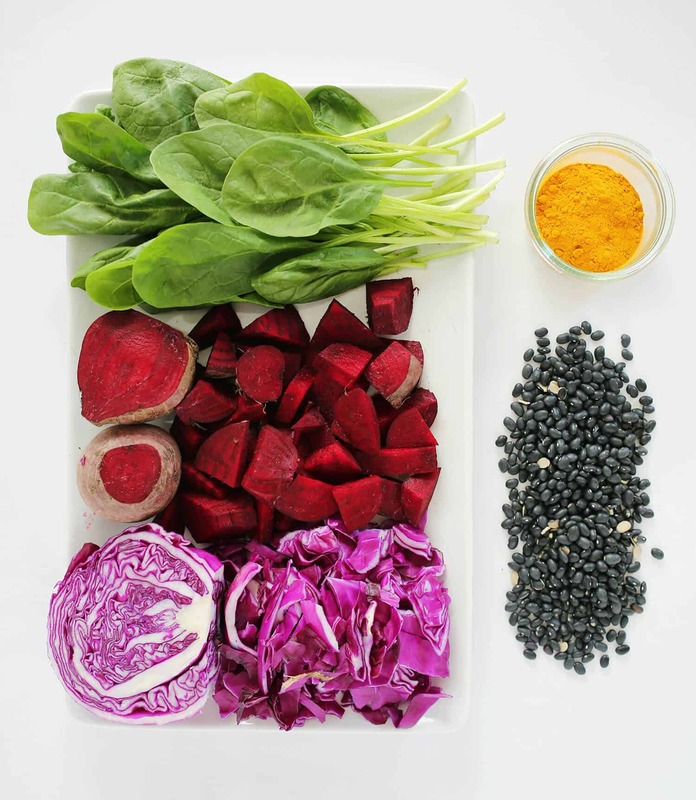 There’s an food blogger on Instagram who regularly uses beets or turmeric to “dye” stuff like mashed potato or cauliflower to make meals more interesting for her kids (and to get them to eat their vegetables). These are truly stunning! 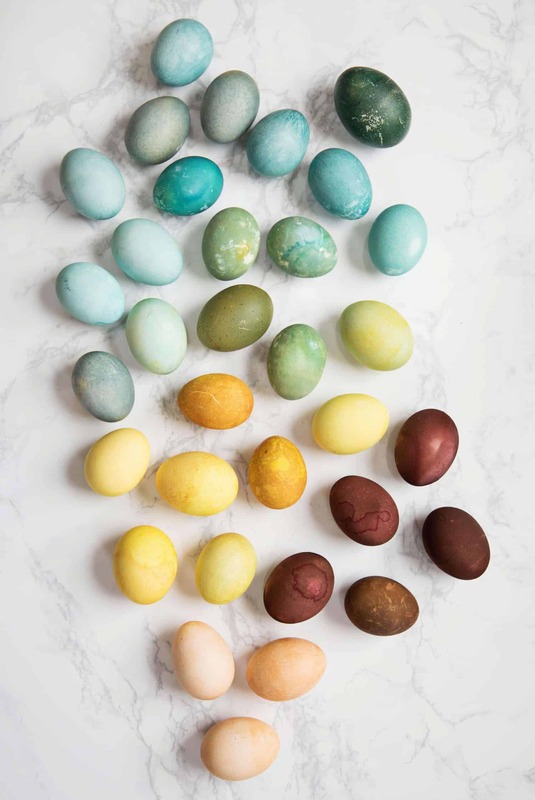 Much more beautiful than any artificially dyed and glittered up eggs for sure. Very nicely done! Hi! Can’t wait to try these! For the turmeric ones, if I cook the eggs for 30 minutes won’t they be inedible!?! Thanks! If you simmer an uncooked egg for 30 minutes it won’t be inedible, but it will be very done or very hard boiled (there is probably a better, more scientific term but I don’t know it). I personally prefer my hardboiled eggs cooked more about the 8-12 minute time, so I would likely opt for the second option (soaking for 2 hours, an already hard boiled egg). But I like my hardboiled eggs on the softer side (where the yolk isn’t completely cooked) but I know lots of people who hardboil for much longer. 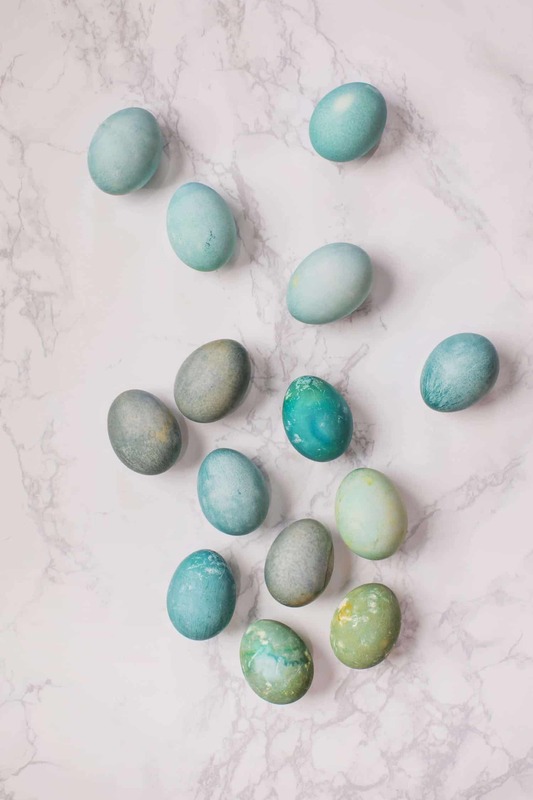 These natural eggs are so beautiful! 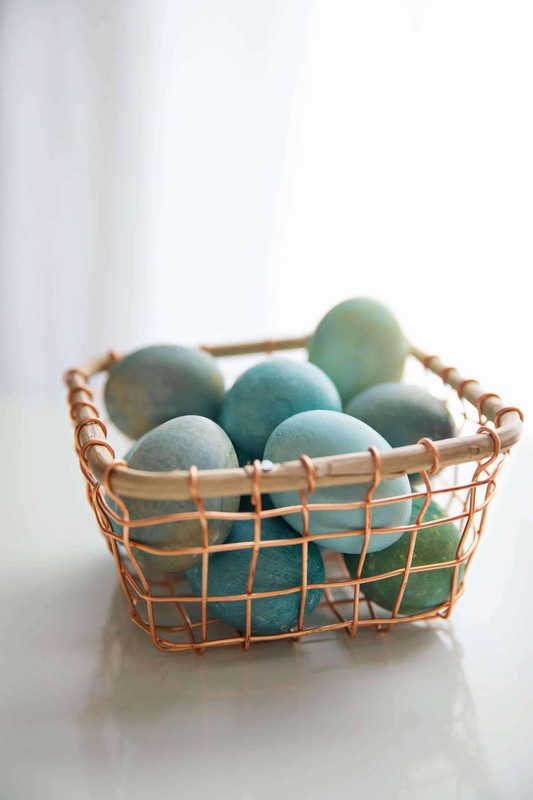 We always used onion peels, and we have a technique where you collect pretty leaves (clovers and other interesting ones), lay them flat on the egg, wrap the whole thing in an old pantyhose and boil them in the dye – they make so pretty marks on the eggs! I was going to mention this method, too! My Mom places different herb leaves (parsley & dill are really pretty) in the eggs & carefully ties cheesecloth around them before dying them in brown and/or red onion skins. It can take some practice to get the herbs to lay flat against the eggs, but the results are gorgeous! WHOA these are beautiful. Bookmarking this one for sure! It’s pretty but I literally can’t imagine doing this. This is like making your own condiments level of togtherness and dedication. Mack, Haha! It’s true! You really have to have a reason to put that extra effort in but I think sometimes you get to a point where it feels like fun instead of just a lot of work. I’ve always wanted to try this, these colours are so beautiful! Especially the shades of blue and red! these are way beautiful! I agree with this sounding so overwhelming but I might try it after reading your notes 🙂 Thanks for simplifying it! If someone wants to try a fast way of dyeing eggs with natural colors, i can recommend putting onion peel around the egg while boiling it. Red onion peel will give a beautiful marbled dark maroon/purple color, and yellow onion peel will give a light brown color. I usually put tin foil around the egg to keep the onion peel at place, and get the marbled look. I have seen others who put some thread around the egg, which can give the egg some nice patterns. Time to start saving the dry onion peels to have some for my easter eggs! 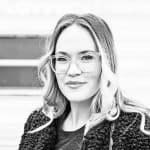 I have fall in love with your blog. Your pictures are so beautiful. 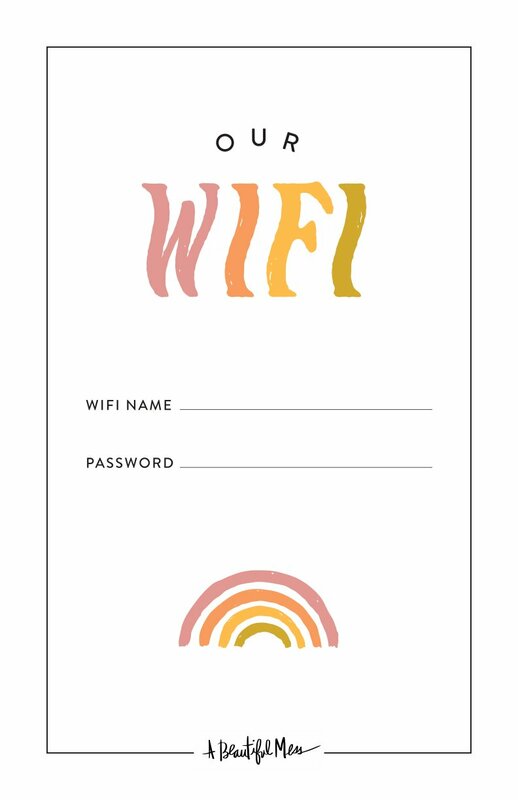 I discovered your blog through bloglovin an I have included your blogpost in my recommendations to parents. I will dye my Easter egg following your instructions! Omg rachel this is SO FUN! Thanks for eggs-perimenting (had to) so we can reap the rewards!! Thank you! I love that you added another egg pun. It’s just way too easy! Love these eggs! But not sure on measurements especially for the turmeric. Thanks! There’s probably a little wiggle room for some of the dye stuff measurements but these are all the measurements from the experiments shown in the photos. Did you use them and have an issue with them? I’d love to hear what you would adjust so we can add any edits for future users. 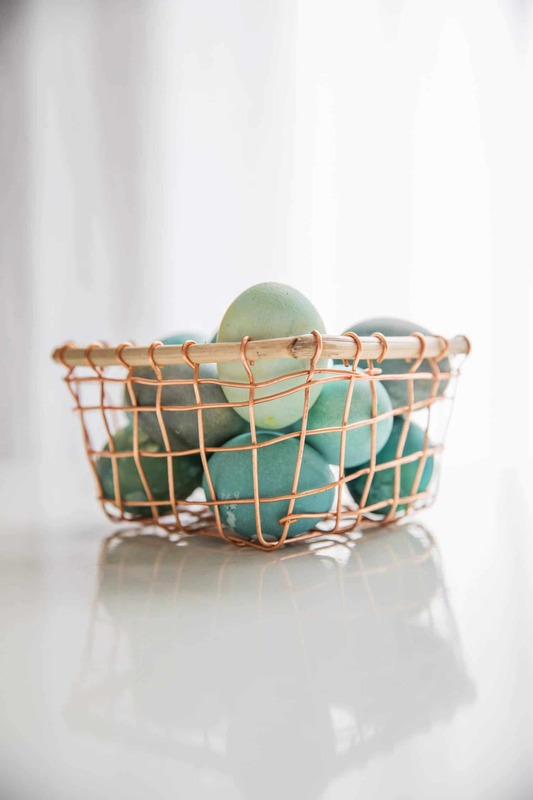 FELL IN LOVE WITH THE COPPER BASKET! Where is it from? Is it DIY?